An Expert from "A Gazetteer of the State of Maine"
Somerset County is one of the great central and northern counties of Maine. It is about 135 miles in length, north and south, with an average width of some 30 miles. On its eastern line, about midway of its length, lies Moosehead Lake, 40 miles in length. Between this and the western border of the State is a chain of ponds, extending quite across the county, and discharging into Moosehead. The Kennebec River, for fully half its length, lies in this county. In its northern part rise both the Penobscot and the St. John Rivers. The million acres of land purchased by William Bingham of Philadelphia, in the western part of the State lie mostly in Somerset. The bounds of that purchase commence at the south-eastern angle of the Wellington in Piscataquis County, extending northward on the east line of the town, and westward on its south line to the south-western angle of Mount Abraham Township, thence northward on its west line to the north-western angle of No. 6 of Range 7; whence it runs easterly on the north line of this township to Moosehead Lake, intersecting the eastern line near the north extremity of Deer Island. The mountains of this county of present note are Mount Bigelow, on the southern border of the most western part, Squaw, Fletcher, Johnson, Pierce, Spencer, Heald, Bald, Owl's Head Sally, Moxie, the Bald Mountain Range, Culcusso and Mucalsea mountains. The industries of this county are chiefly agricultural; and having a good soil, few farmers fail to make a good living. Neat cattle and sheep are raised in large numbers. 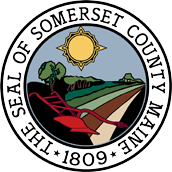 Somerset County was incorporated March 1, 1809. Its territory was formerly embraced in Kennebec County; and sections of it have since been taken to form Franklin and Piscataquis counties. Norridgewock was the shire town until about 1870, when a new and elegant brick building containing a court-room and offices are presented to the county by Hon. Abner Coburn, and the county seat was changed to Skowhegan. There are now twenty-eight towns and four organized plantations. The townships classed as Wild Lands number 68. The number of polls in 1870 was 8,169. In 1880, 8,698. The number of children of school age in 1870 was 11,068. In 1880 it was 10,873. The population of the county in 1870 was 34,611. In 1880 it was 32,399. The valuation in 1870 was $10,048,159. In 1880 it was $12,128,878.